In this article, let’s talk about molting cockatiels. Even though your cockatiel may look slightly off-color or sickly, it is actually quite a natural process. Feathers are your cockatiel’s defining feature. You have all seen how ugly they look when they are baby cockatiel chicks without feathers I’m sure? Feathers impart the ability to fly, provide weatherproof warmth and give the cockatiel its dashing good looks. Your pet cockatiel will molt about once every year. So, don’t worry, molting cockatiels are normal. His first molt will happen between the ages of 6 and 12 months old. After the first molt, healthy cockatiels will have a normal molt 2-3 times each year. It can take 7 to 10 days for a new feather or blood feather to begin emerging in the place that the old one fell out, and then it can take another 6 to 8 weeks for the blood feather to grow in completely. When molting, your cockatiel will lose its feathers. This happens so that the bird’s body can make way for new feather growth. Not all its feathers fall out together, and the molting cockatiel could be in this state for up to 6 months while the new feathers grow out. Some cockatiels seem to molt all the time, with feathers falling out and growing in at all different times, and others just once or twice a year. You will know when your cockatiel is molting because you will see a lot of feathers at the bottom of the cage. Your bird will take on a rather scruffy looking appearance with a lot of new stubby aglets, which look like the plastic tips of your shoelaces, all over his body and head. These are merely the feather sheaths that help the new pinfeathers to break through the skin. They are made of keratin, just like our fingernails. These sheaths also help to protect the new feathers from being damaged while the new feather completes its growth cycle. Your pet cockatiel will seem a little more irritable than normal during molting. This is to be expected, as he will feel itchy and uncomfortable for a while. During the molting process, your cockatiel may experience a few behavioral changes. The sensitive new feathers can be painful to touch, and the itchiness caused by the flaking feather sheaths may make your cockatiel a little uncomfortable and moody. 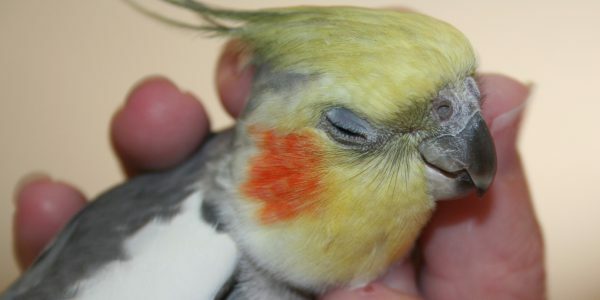 It is also normal for your bird to also seek you out more during this stage, as he may have an itch that he wants you to scratch on the top of his head that he just can‘t get to. Just be sure to be gentle with these new feathers, as they are still growing in and may be sensitive when touched. Keep the room temperature between 75 and 80 degrees Fahrenheit during this time, especially with heavy shedding. Decrease stress by emphasizing security and rest periods. Be sure to keep his nutrition balanced. Some cockatiels will benefit from special conditioning foods like the molting supplement on the right, but you could check with your avian vet first, to see if your molting cockatiel is a candidate for these.